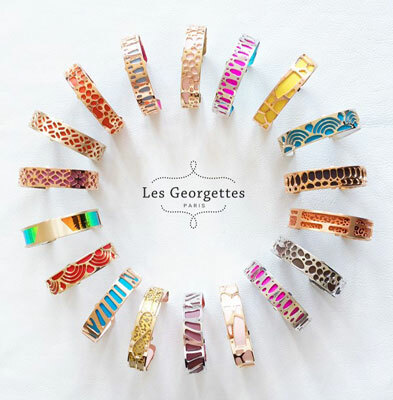 Les Georgettes is an innovative concept that combines fine custom jewellery with interchangeable colours and reversible leathers. ADD your reversible leather of fluid-Perspex. A UNIQUE ACCESSORY MADE FOR YOU. In few seconds, every woman can create her very own collection of exclusives Georgettes by changing or reversing the leather to go with her outfit, her bag or her mood! Les Georgettes is the creation of the renowned ALTESSE house, France's leading jewellery manufacturer and TEXIER, a prominent and distinguished leather goods manufacture in Brittany; two premier companies which are officially recognised as part of France's National Heritage. Today, Altesse employs over 250 craftsmen and manufactures and distributes gold and sterling silver finished jewellery in over 60 countries.